You can easily share Metrics / Reports / External Reports with Users registered in Metric Insights via the Share function, available at the top right corner of the element Viewer. 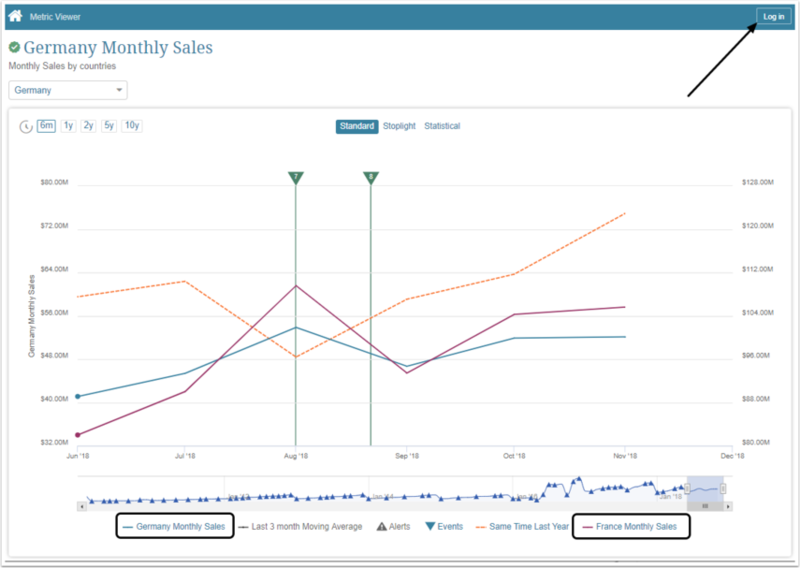 You can also make Metrics and Reports public and share them with people who have no account in Metric Insights. In the Ownership & Access section define whether This Metric is "public" or "internal". If the Metric is set to public, a Metric URL is displayed below. This is the link that you can use to share this specific Metric with any person not registered in the system. Note: Only Metrics with public settings can be shared via URL. Let's review the following example. We have a "Monthly Sales" Metric dimensioned by country. We can add several Dimension Values as overlays within one View. For example, we can overlay data for both Germany and France. Refer to Overview of Metric Overlays for more information. Go to Metric Editors > Advanced tab and make both Metrics public (as described in the first section of this article). This way you can be sure that an unregistered User is going to see the Metric and its overlays. By following the provided link, a user will have access to the Metric and to basic Metric Viewer options (such as, different Views, Dimension Values, Range selection, Annotations, Overlays). 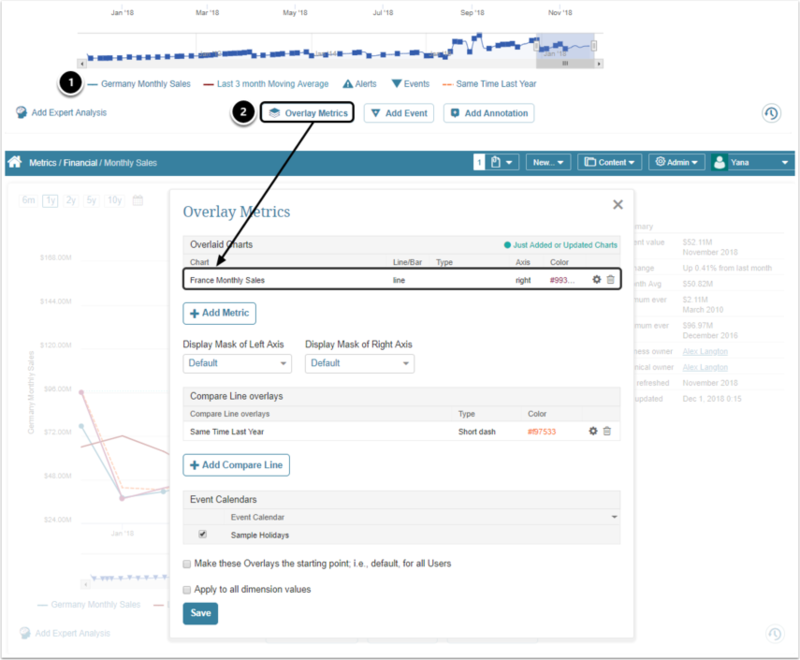 Alerts, Notes and Comments are not displayed to a User having no account in Metric Insights. NOTE: The same logic applies to Reports. 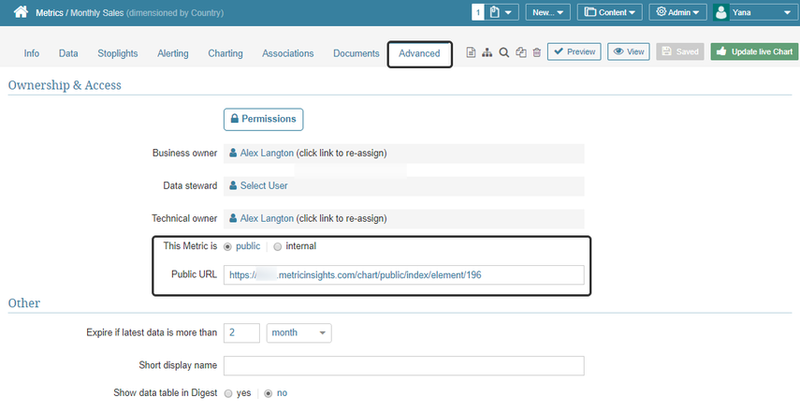 External Reports cannot be shared via a link.